The Rolling Stones played at a concert Saturday night at The Barclays Center in Brooklyn, New York. It was packed with so may people and every seat was filled. Mick Jagger, Keith Richards and Ron Wood and other various members of his band played for about 2 1/2 hours and everyone in the audience was singing to all their songs such as "The Last Time," "Wild Horses" and "Honky Tonk Woman" just to name a few. They are celebrating their "50 and Counting" tour. Mick Jagger sang and danced around the stage and Keith Richards and Ron Woods also came out onto the front of the stage playing guitar. Their was also Mary J. Blige singing "Gimme Shelter," and Gary Clark Jr. playing guitar and singing. Mick Jagger kept the crowd engaged and looking at him he is still thin and has his hair in the same style and he was dressed in black with different fancy jackets and running shoes. He thanked the audience a few times and he said that people always ask him why do you keep touring and he said to the audience that you are the reason why we really do this! I loved this show and I think out all the concerts that I have seen, it was the best one so far! 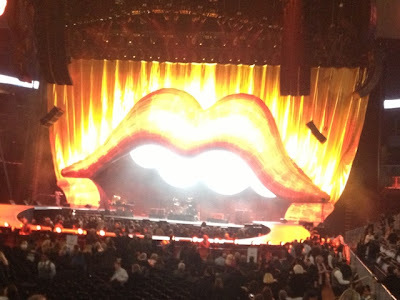 This is a picture of what the stage looked like with the big lips!